It’s not often I work on Cisco routers, but as I tend to do most of the Cisco ASA Firewalls, I’m the unofficial “Cisco Guy”. Which is fine until someone wants a router or some complex switching, then I need to do some heavy duty frowning. Last time I put in a Cisco router it was a baby Cisco 800 series (an 877W) so I assumed the 1921 ISR router I had to put in would be the same. Before I used the Cisco SDM console that’s now either depreciated or not used, and a quick look in the flash memory of the router told me there was nothing in there apart from the IOS. 1. 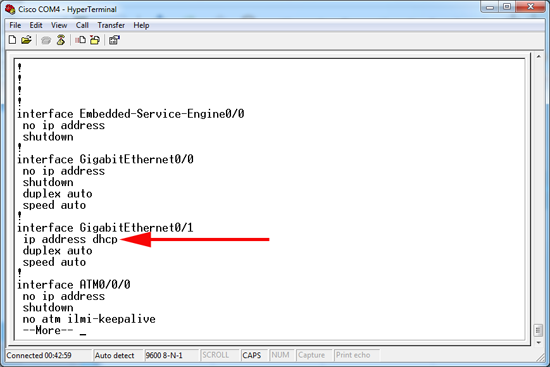 Express – this installs on the router itself and is a cut down version. 2. PC Version – the full suite of tools installs on a Windows PC (that has Java installed) Note: is does NOT need anything else installing on the router. To download the software you will need a valid Cisco CCO login and a valid support contract (or SmartNet) for your router. (download link). 1. Using the console cable provided with your router connect a PC/Laptop to the router and access using Hyperterminal or PuTTy, (See here for details). 2. 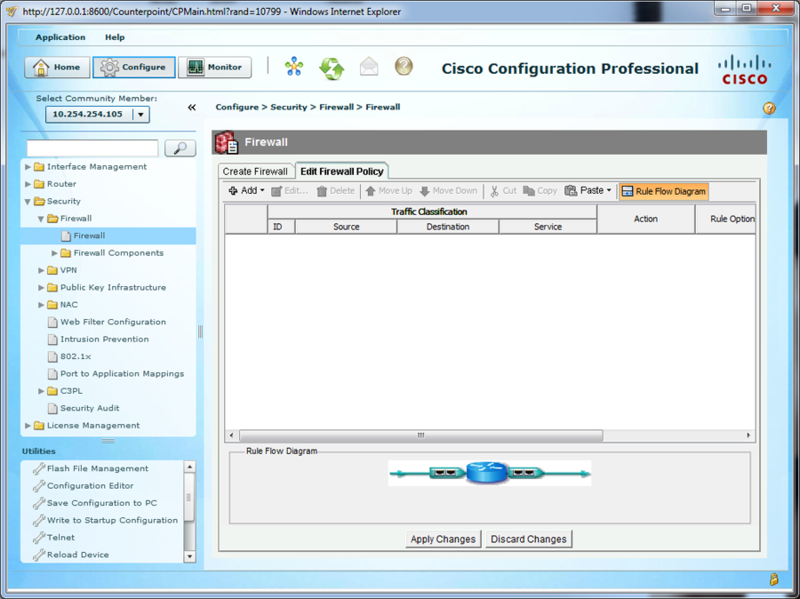 Connect an ethernet port to your LAN, we are going to configure it to get an IP from DHCP (assuming you have DHCP of course if not give is a static IP address). 3. 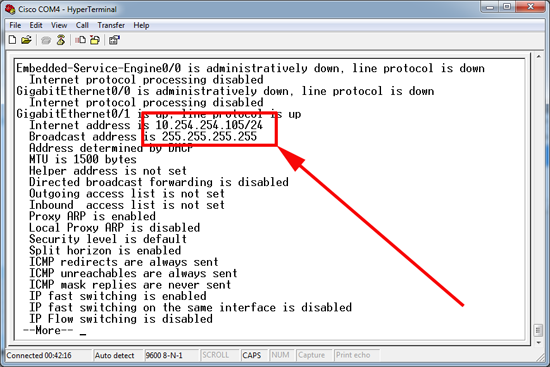 While connected via console cable, go to enable mode, set the ether net port you connected to DHCP, then configure Telnet and SSH login, and finally allow HTTP access.
! 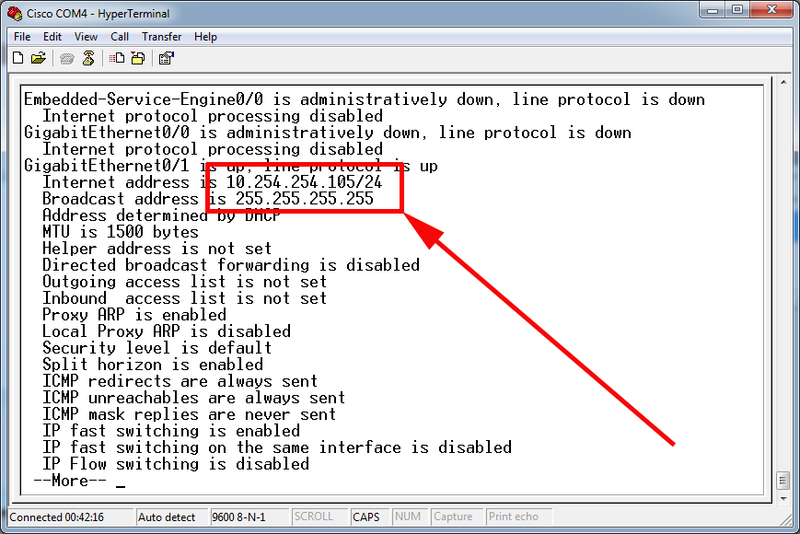 <<<<<<<Note: Make sure the Ethernet ports you will use are NOT in a shutdown state! 4. 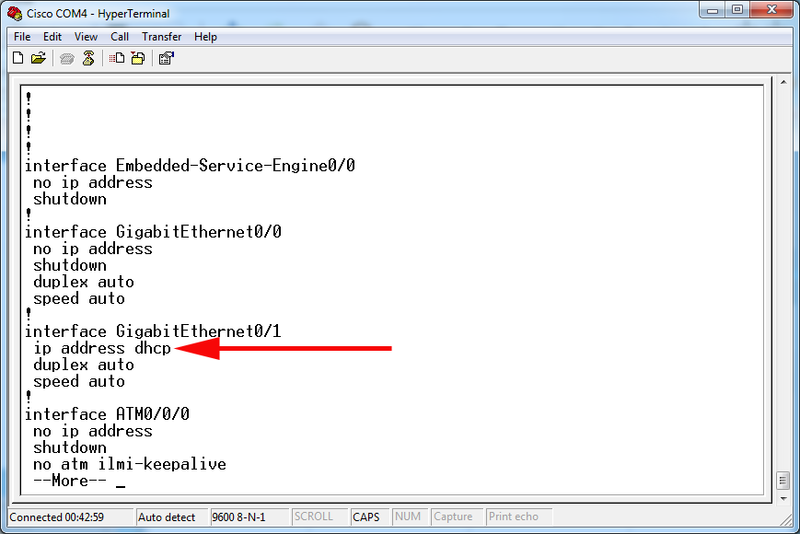 So all being well, this is what you should see if you issue a “show run” command. 5. 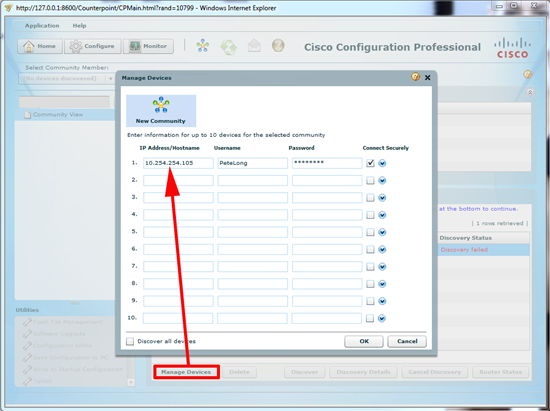 Lets make sure it got an IP address with “show ip interface”. 6. 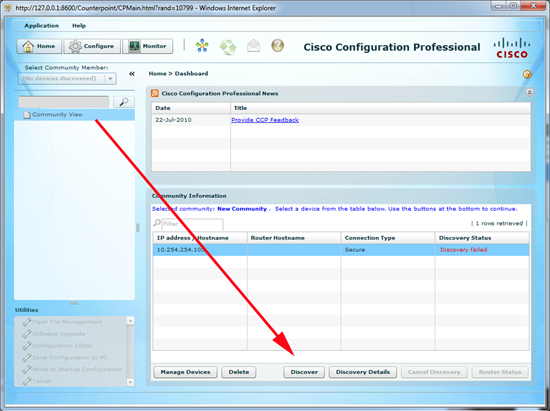 Install CCP on you PC and launch it > Select “Manage Devices” > Enter the IP, username and password you set earlier > OK.
7. If discovery fails make sure you’re cabled correctly and select “Discover”. 8. 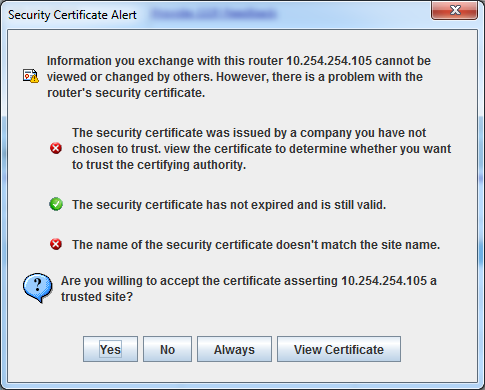 It connects over https so it’s normal to see this, just click yes. 9. 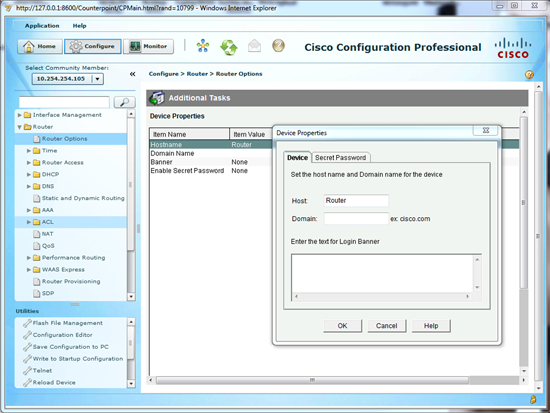 You can now configure the router as required. 10. If you have the Security/Firewall IOS you can also manage that from here.